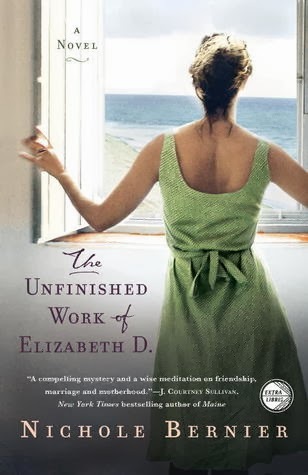 Book By Book: Fiction Review: The Unfinished Work of Elizabeth D.
Fiction Review: The Unfinished Work of Elizabeth D.
I had been suggesting The Unfinished Work of Elizabeth D. by Nichole Bernier to my neighborhood book group for several months, so I was thrilled when the group finally chose it for our February selection. Everyone in the group enjoyed this insightful book about women, friendships, secrets, relationships, motherhood – there is just so much packed into this engaging novel that we had plenty to talk about! As the novel opens, Kate, a mother of two young children, is still trying to adjust after the startling death of her closest friend a year before in a plane crash. The September 11th attacks occurred just a few months after her friend Elizabeth’s death, and both events have left Kate feeling rattled. On their way to their annual family beach vacation, Kate and her husband and kids stop at Elizabeth’s house to pick up a small trunk that was left to Kate in the will. Elizabeth’s husband, Dave, is not too pleased that his wife mysteriously chose to leave this trunk, filled with journals that Elizabeth wrote, to Kate. She wanted Kate to be the one to read the journals and decide what to do with them. On their vacation, Kate begins to make her way through the journals, starting at the beginning when Elizabeth was only a young teen, as her friend had requested. Before long, the journals have become something of an obsession for Kate, much to the irritation of her husband, Chris. It turns out that sweet, placid Elizabeth had a number of secrets – things she’d been through and hadn’t ever shared – as well as secret insecurities and anxieties that Kate never even suspected. Kate begins to wonder whether she really knew her old friend, and as she reads about some problems and secrets in her marriage to Dave, she also begins to question the stability of her own marriage to Chris. This story is engaging and compelling with a bit of a mystery at its core – everyone in the group said they read it quickly and had trouble putting it down – but it is also thought provoking and insightful. Our group talked about it easily for a couple of hours, jumping from topics of women’s friendships to marriage to motherhood to journal-keeping to post 9/11 anxieties and secrets….and then after I got home, my mind was still spinning, thinking, “Oh, we didn’t talk about that” and “I should have asked what everyone thought of this!” In short, this novel really got under my skin and made me think. With the dawn of real traveling freedom just ahead for us, with one son in college now and one in high school, I identified with every tired, yearning, nostalgic word of that passage. I thoroughly enjoyed every moment of Bernier’s first novel and can’t wait to read her next one, which she describes in this video. I love that cover and the title is so intriguing. I'm always thrilled when I hear about a writer who takes time to interact with a book club. Fabulous opportunity for a behind the scenes look at the writer's life. I'm stopping by from Small Victories linky today.